Singer Boy George has developed a throat condition which has led to his re-formed group Culture Club pulling out of a US and UK tour. The star needs treatment for a polyp which has led to the dates - due to begin in Glasgow next month - being cancelled, although they are hoping to reschedule. It would have been the Karma Chameleon hitmakers' first tour together for 12 years. 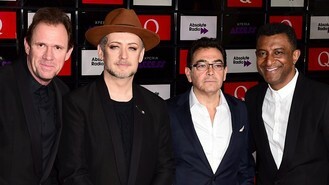 Boy George said he was devastated, adding: "I want to be able to perform to the best of my ability and the specialist has told me that right now that will be impossible. "I will focus on getting better and see all my fans soon." Review: One Direction's 'Four' teen dream in song. Review: Lorde's 'Mockingjay' soundtrack gets dark. NEW YORK — If you go to a Sam Smith concert, you'll probably hear his stories of unrequited love and how he's never been in a relationship. Music Review: Garth Brooks returns after 13 years, "Man Against Machine". Review: Foo Fighters latest is a worthwhile trip, "Sonic Highways". The new Band Aid song will get its first airing on Sunday's X Factor - just a day after stars including One Direction, Chris Martin and Ed Sheeran team up to record it. Kerry Katona has revealed that Atomic Kitten are making a new album to be released next year. Foo Fighters have announced that they will tour the UK next year. Redfoo has hit back over claims that his new song is sexist, saying that he is being "victimised" by critics.